UPDATED: Fri., Dec. 8, 2017, 5:09 p.m.
SEATTLE – The historical impact of the Washington men’s basketball team’s stunning 74-65 victory over No. 2 Kansas is staggering. The Huskies entered Wednesday’s game at the Sprint Center 0-29 away from home versus top-2 teams and they hadn’t beaten a top-5 team on the road since 1951. In fact, UW was 4-80 away from home against top-10 ranked teams. But past disappointments played no part in a dazzling performance for the Huskies (7-2) and first-year coach Mike Hopkins, who needed just nine games to notch arguably the biggest nonconference victory in UW history. Here are a few observations on Washington’s big win. Maybe you thought the Huskies were premature in firing Lorenzo Romar last March. Maybe you were underwhelmed with UW hiring Hopkins, an assistant at Syracuse the previous 22 years with no real head-coaching experience. And maybe you were underwhelmed by Washington’s 6-2 start, which included wins against mid-majors and losses on the road against Power-5 Conference teams. But there’s no disputing that Hopkins can coach. One game didn’t necessarily prove that, but his steadfast belief in the 2-3 zone is unshakeable. He’s a devout disciple in the zone and he’s gotten the Huskies to wholeheartedly believe and execute the defensive scheme. Hopkins and his coaching staff knew exactly how they were going to slow down a Kansas offense that averaged 91 points and ranked sixth in the nation in scoring. They made it a priority to disrupt KU’s three-point shooting and held the Jayhawks to 5-for-20 shooting behind the arc. In doing so, UW allowed junior guard Lagerald Vick a career-high 28 points on 12-for-23 shooting mostly in the paint and within 5-foot of the basket. No KU player took more than 12 shots. Washington negated Jayhawks leading scorer Devonte Graham who entered the game with back-to-back 35-point outbursts. UW also shut down Svi Mykhailiuk, KU’s second leading scorer, who finished with 8 points on 3-for-12 shooting. It was a gamble in tactic, but more of a belief. Hopkins has preached the Huskies will win with its defense and they did Wednesday while holding the Jayhawks to 45.2 percent shooting from the floor and 25 percent (5 of 20) on three-pointers. Perhaps even more impressive is UW played stellar defense without fouling. Kansas attempted just eight free throws – a season-low. 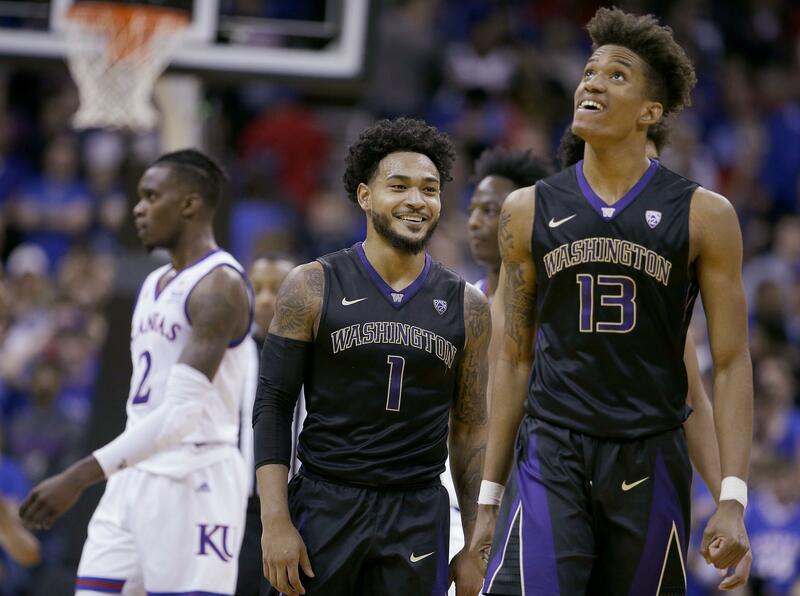 David Crisp, Noah Dickerson and Matisse Thybulle – UW’s core trio of juniors – endured a lot of losing and upsets in the previous two seasons. Each had starring roles in the biggest win of their lives. Let’s start with Crisp. Point guards are over-analyzed. It’s so easy to second guess a playmaker’s decision on when to shoot and when to pass. Crisp receives a hefty amount of criticism from UW fans for his shot selection and perhaps not enough praise for his offensive stewardship. Against Kansas, Crisp had arguably his best game as a floor general. He finished with a season-high seven assists, which offset three turnovers in 37 minutes. He sank 3 of 9 shots, including two three-pointers and none was bigger than a dagger 3 off a loose ball scramble that put UW up 73-59 with 2:16 left. Dickerson has been able to dominate undersize teams, but there were questions on his ability to be effective against stiff completion with a big front line. KU isn’t impressively tall. Aside from 7-foot center Udoka Azubuike, the Jayhawks are thin in the paint. Still, Kansas’ dearth of post players doesn’t detract from Dickerson’s dominant display in the post. He’s scored more points and collected more rebounds, but not sure he’s played a better game while finishing with 13 points, 14 rebounds and five assists in 31 minutes. Dickerson was able to play so many minutes because he committed a season-low tying two fouls. When Thybulle connects on 5 of 8 three-pointers, the Huskies aren’t going to lose very many games. His offense is usually an added benefit so there’s no minimizing how much his season-high 19 points (1 shy of his personal best) played a role in UW’s win. Thybulle also helped facilitate the offense with three assists. And the 6-5 guard is the leader on defense where he finished with a block and two steals, including the play of the game. With 6:58 left Thybulle stole a pass and raced ahead for a signature two-hand slam dunk that gave the Huskies a 64-54 lead. The Huskies aren’t likely to face another team ranked No. 2 or higher this season. But just because they dominated Kansas in a game in which they led for nearly 29 minutes, doesn’t mean Washington will go undefeated for the rest of the season. Still, expectations will rise for the Huskies. Washington owns the best win this season in the Pac-12, which had struggled against nonconference completion before last night. (Arizona also toppled No. 7 Texas A&M 67-64 on Wednesday). The Huskies, which were picked to finish 10th in the Pac-12 in a preseason media poll, look much better than they did before the season. Washington hasn’t finished higher than sixth in the Pac-12 regular season since winning the conference title in 2011-12. And then there’s that NCAA tournament drought. The last time UW participated in the Big Dance was 2011. No one expected Hopkins to deliver a trip to the NCAA tournament in his first season, but no one thought the Huskies would beat Kansas. They were a 22-point underdog and given a 3.2 percent chance of victory based on ESPN’s basketball power index (BPI). The Huskies were 103 in the RPI rankings on Wednesday. Today they are 48. The bracketologists aren’t including Washington in their latest NCAA tournament projections, but a win this Sunday against Gonzaga will surely put the Huskies on the national radar. And just maybe, we’ll get to see more celebrations like the bedlam that occurred in the UW locker room on Wednesday. Published: Dec. 8, 2017, 5:01 p.m. Updated: Dec. 8, 2017, 5:09 p.m.